A few days ago I went down the hall to a coworkers office for some conversation. We got to talking about holsters and drawing from them. I was explaining how when you draw from the hip, you draw the gun straight up from the holster, and then pivot it forward right next to your body. 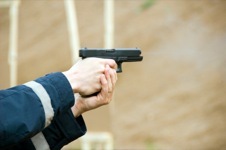 Then you push the gun out toward the target. I explained the reasons for doing it this way, but the comment stuck in my head for later contemplation. You know what? Natural is almost never optimal. Did you throw a baseball well the first time you tried? How about a football? Is there any athletic endeavor that the way you naturally do it the way you should? The exception that proves the rule is what we say when a person does something well the first time. This means he naturally does something optimally, which is different from everyone else. Even then we know we can train him to do it even better. So if something feels natural the first time, it is probably wrong. But the goal of training is to make something optimal feel natural. I could also apply this to philosophy, morality, and theology, but I’ll leave that as an exercise for the reader.